The story of the strange mixture of romanticism, militarism and technology that has made planes so important to England, from the brilliant author of Britains War MachineThe history of England and the aeroplane is one tangled with myths - of the Few and the Blitz, of boffins, flying machines, amateur inventors and muddling through. In England and the Aeroplane David Edgerton reverses received wisdom, showing that the aeroplane is a central and revealing aspect of an unfamiliar English nation: a warfare state dedicated to technology, industry, empire and military power.England had the strongest air force in the Great War, the largest industry in the world in the 1920s, outproduced Germany by 50% at the time of the Battle of Britain and was the third largest producers of aeroplanes well after this time. 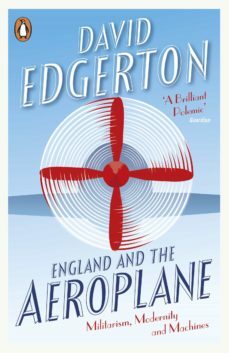 In a revelatory recounting of the story of aeronautical England, from its politics to its industry and culture, David Edgerton reconfigures some of the most important chapters of our history.Reviews:A brilliant polemic GuardianFull of good stories ... an illuminating read SpectatorA tour de force, after which the history of the aircraft industry will never be quite the same again Business HistoryDavid Edgertons sure-footed essay ... sees Britain from an unusual perspective ... His arguments provide sound backing for the idea that modern Britain is as much a warfare state as a welfare one EconomistAbout the author:David Edgerton is Hans Rausing Professor at Imperial College London, where he was the founding director of the Centre for the History of Science, Technology and Medicine. He is the author of a sequence of groundbreaking books on 20th century Britain: Science, Technology and the British Industrial Decline, 1870-1970; Warfare State: Britain, 1920-1970; and Britains War Machine, published by Penguin. He is also the author of the iconoclastic and brilliant The Shock of the Old: Technology and Global History Since 1900.